Kader Munshi, son of late Abdul Kuddus Munshi hails from Jahangirpur village under Nandail Upazila of M ymensingh district. He turned himself into a successful businessman from destitution over a period of last 10 years. He owns two factories set up on 20 decimals of land purchased for a total of BDT 5.5 m. He has 5 full time and 30 per-time employees working in his factories. His present average monthly income is BDT 195,000.0. His father was an agriculture laborer and died in 2004 leaving behind no assets for his 4 sons to survive. In utter desperation Kader left behind his family members and migrated to Gazipur looking for a job. He had no formal education and faced with difficulty to get one. However he finally started collecting recycle materials in baskets hanged from his shoulder from distant villages for some Alam in Gazipur sadar Upazila. He used to earn between BDT 80.00 to BDT 100.00 per day from the job. He decided to start his own business with recycle materials. So he returned home during Eid holiday after 5 months and borrowed some money from local money lender. He came back to Gazipur with his family, hired a shed and set up his shop. 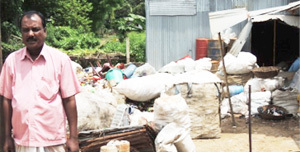 He hired two persons for his business and paid an advance of BDT 1,200.00 to them for collection of recycle materials for his shop. One of the guys was a drug addict and fled with his money. It was a blow for his fledgling business. He did not know what to do and how to make up for the loss. While he was still in quandary Madina, his wife came with the good news what he was waiting for. With his consent she soon became a member of Badhan Mohila Samity, one of Pidim Savings and Credit Group. Pidim lent her BDT 10,000.00 after two of their neighbors agreed to stand guarantee for the loan. This was the most defining moment of the life of Keder. He was fired up and put all his time and efforts into his business. As a result his business thrived and within a short period of time he could establish himself as a successful entrepreneur and a businessman. He saved BDT 150,000.00 with Pidim and took a loan of BDT 700,000.00 from Pidim last time for his business. He processes plastic materials for sale in wholesale market in one of his factories. The other is used for packing of recycle materials. He now wants to expand his business creating employment of more people. Kader is also a devoted father. He pays proper attention to education of his son and daughter. His son passed HSC with distinction and his daughter now studies in class VIII. Overall Kader is a very successful man and an example to others. He proved that one can prosper in his life amid poverty and destitution, if he has a positive mindset and strong determination.